This ONLINE course is for the professional who wants to learn more about common hair loss and scalp conditions but who does not want to practice trichology as a profession. Students who successfully complete the Associate Trichology Diploma course will receive an Associate Trichologist diploma and be termed as an "Affiliate Member of the WTS". Students who successfully complete the Higher Associate Trichology Diploma course will receive a Higher Associate Trichologist diploma and be termed as an "Associate Member of the WTS". These on-line courses can be taken in the comfort of your home or office. The coursework is emailed directly to your email address. Students who successfully complete the Two-day Trichology Workshop will receive a Higher Associate Trichologist with Honors diploma, but will still be termed as an "Associate Member of the WTS". 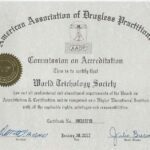 Successful completion of the Higher Associate Trichologist course can be used as partial credit for the World Trichology Society's full trichology certification course. Affiliates and Associates are NOT fully certified trichologists but are proficient in basic trichological knowledge. -Prescription & trichological treatments for each. PLEASE CLICK ON THE BOXES BELOW TO MAKE YOUR PAYMENT.